Last February, the ACLU sued the Trump administration in federal court, challenging its illegal and cruel practice of separating the children of asylum-seekers and border-crossers from their parents. The events that followed shocked the world, as thousands of minors were locked away in immigration facilities alone while their parents were detained far away. On June 26, U.S. District Court Judge Dana Sabraw issued a preliminary injunction that ordered the government to return all children under five years old to their parents within 14 days and within 30 days for the rest. The government has since provided the court with data that indicates at least 2,654 immigrant children were separated from their parents or caregivers as a result of Trump administration policies. Further data was provided to the ACLU about the age and gender of those children, their country of origin, and how long those still in the custody of the Office of Refugee Resettlement (ORR) have been held. The ACLU is making this data available here to help illuminate the details of this devastating policy. For hundreds of these children, the nightmare isn’t over yet. While we believe this data provides a valuable window into the family separation crisis, we also have some concerns about how comprehensive and accurate it is. On Oct. 2, the Department of Homeland Security’s inspector general released a report which stated that “DHS struggled to provide accurate, complete, reliable data on family separations.” The eventual reunification of these children and parents was, by all accounts, not a priority of those who designed and carried out the policy. The ACLU has not undertaken an independent data investigation, and instead has had to rely on the numbers provided to us by the government. 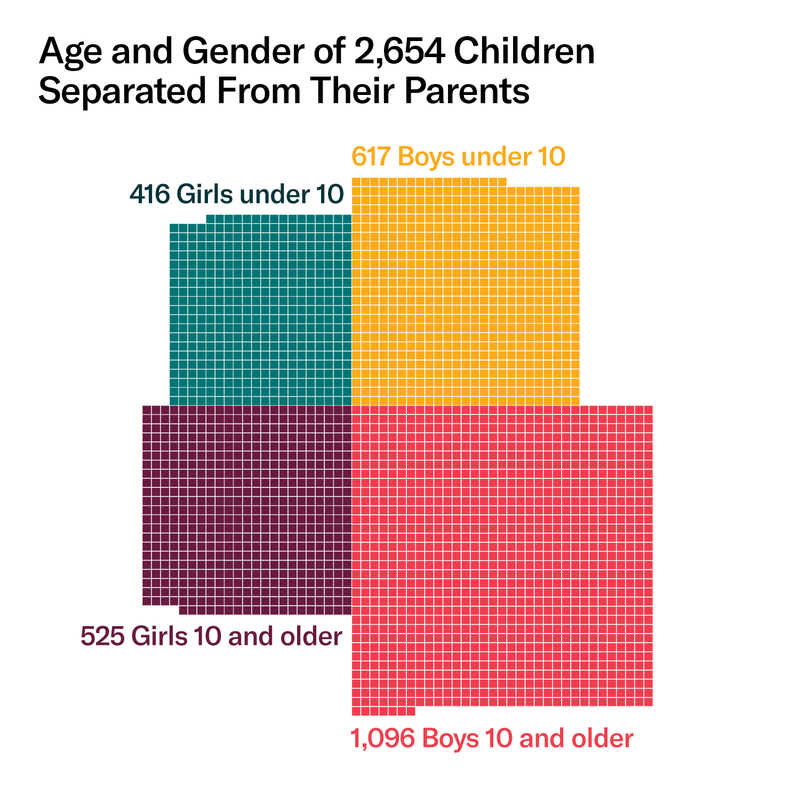 Thus, this data may well undercount the number of children who were separated or contain other gaps. According to the government’s status report to the court on Oct. 15, there were 2,654 children initially determined to have been possibly separated from their parents. Of that number, 2,363 have been discharged from ORR custody, and the government says that 46 turned out not to have been accompanied by a parent when they crossed the border. Another 125 children have made the difficult decision — in consultation with their parents, who have already been deported — to remain separated in order to stay in the country and pursue asylum. These 125 are thus not seeking reunification with their parents at this time. Their main pathway to release at this point is to live with other family or sponsors here in the U.S. This leaves 120 children who were separated from their parents, were in ORR care as of Oct. 15, and who have not decided to waive reunification. We believe that every separated child and parent who want to be reunified should be reunified. These 120 children fall into two groups: 50 with parents who were removed from the U.S. by the government and 70 whose parents are still in the U.S. The ACLU and a Steering Committee composed of the law firm of Paul, Weiss, Justice in Motion, Kids in Need of Defense (KIND), and the Women’s Refugee Commission have been working to locate the deported parents of children still in ORR care, document decisions about reunifying, and make sure the families are making an informed choice. Of the 50 children with parents outside the U.S. who have not waived reunification, about 20 are waiting to be sent back to their country of origin to be reunified with their parents. Around 15 of them have parents who haven’t yet signed and submitted the forms required for reunification; approximately ten are still in discussion with their children and counsel about their options, and five have parents who haven’t yet been reached. Many of these families could be reunited if not for the government’s opposition to reunifying them, along with other delays the government has not yet explained. In the case of 13 of these children, the government has not identified a reason why they have not yet been reunited with their parents. One of the 70 has a parent who is in the custody of government agencies other than ICE. Once this parent is transferred back to ICE custody, they may then be able to be reunited with their children. Two more children are not reunified because of “red flags” for an ongoing safety review. Twenty-six of those 70 children have parents whom the government have said are disqualified from being reunited with their children because they have been labeled “unfit or present[s] a danger to the child.” These parents have been placed into this category and prevented from being reunited with their children on the basis of past allegations or convictions. The ACLU is concerned about this category given its inclusion of parents who have no criminal convictions outside of their prosecution for immigration violations, as well as those with other criminal histories that should not result in losing custody of their children. Twenty-seven more of the 70 children have parents inside the U.S. who signed paperwork while in custody indicating they would allow their child to leave ORR care to live with a sponsor. The government considers these parents to have “indicated an intent not to reunify,” and their children are still in ORR care, having neither been reunited with their parents nor released to a sponsor. How long have they been separated from their parents? What was their age and gender? Separated children were sent to 121 different detention or care centers in 17 states throughout the country, often hundreds or thousands of miles away from where their parents were held. The largest network of child detention centers are the Southwest Key facilities in Arizona, California, and Texas, where 1,091 (41 percent) of the children were detained. While the majority of these children have since been returned to their parents, for security reasons we are not providing the name or location of these facilities. Because children under five were generally — although not always — expedited for reunion with their parents, the data on their cases is less complete than for the pool of older children. Thus, country of origin data below is limited to children between 5-17 years old. Of that group, 1,423 (55.8 percent) were from Guatemala, with another 848 (33.2 percent) from Honduras. Much smaller numbers of separated children were from El Salvador (179), Brazil (43), Mexico (30), Romania (12), and elsewhere.